A much sought after and oft-requested classic. It's been a long time coming (I only managed to acquire a copy about a year or so ago) but well worth the wait. And many will already be familiar with it, by reputation if nothing else. For the uninitiated, what we have here is the result of somebody, possibly director Raj Kapoor, coming up with the fairly unique idea of releasing, in addition to the conventional song based soundtrack album, Laxmikant Pyarelal's background score to 'Bobby' as an extended instrumental suite, spread over two LP sides. And what a great idea that was. It's a delight to listen to, from beginning to end. 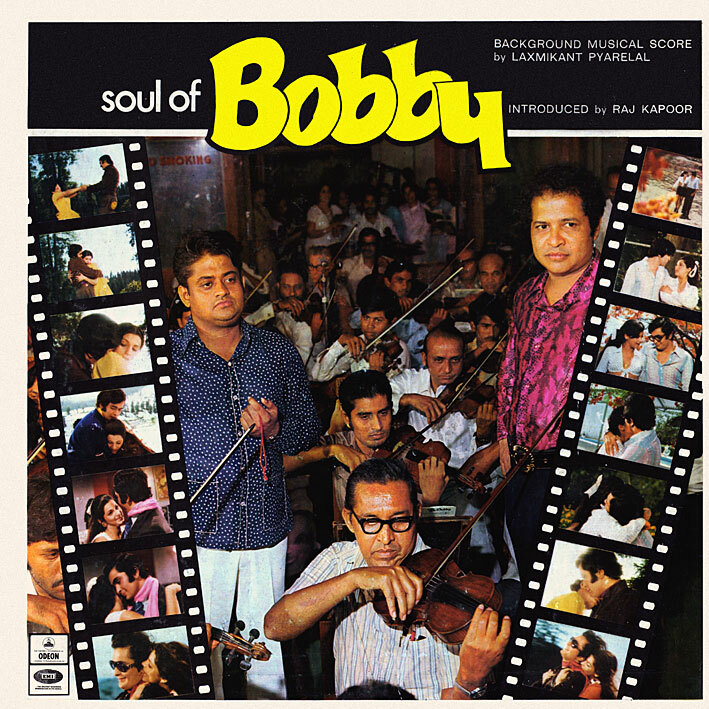 'Soul Of Bobby' contains more or less everything a good Bollywood score can potentially throw at you; Indian classical, occidental pop, dramatic orchestrations, experimental playfulness, lounge, funk, jazz, exotica... the works. Seamlessly stitched together into a perfectly flowing whole. I've seen the movie and probably won't ever again; this record on the other hand, I can happily leave on repeat for hours on end. And that, for now at least, was the last post. The box is empty. Around 200 LPs and EPs ripped, scanned and shared. More than I thought, and taking a hell of a lot longer (4 years) than planned (2 years), though there have been a few new acquisitions along the way. It's been good though... partly because I got the chance to give my collection the evaluation I intended, but mostly because of the response. When starting Music From The Third Floor, I didn't dream it would pick up such a following. Therefore thanks are due, to those whom I've befriended along the way, to the many I've engaged in enlightening and fun discourse with, and to all who have shared insight, personal takes, sent me music and otherwise shown support. All very much appreciated. At the moment, there's a part of me not really wanting to hear another Bollywood song for at least a decade. Or maybe it'll simply be refreshing to be able to listen to one without having to author a commentary. Knowing myself though, I'll probably be tempted to grab additional soundtracks, if, as and when they should come my way. In which case, chances are I'll post them here. (That being one of the reasons I'm writing these words as a comment, and not as a seperate goodbye post). So hang on to the bookmark, if you want. I will obviously leave the blog online for as long as the powers that be allows it to, and will still be reading, and sometimes responding to any new comments that pop up. Other than that, this project is now completed. Wow, PC... holy cow! Not only for this news, but also for the cosmetic o'erhaul. Two milestones! Thank you for this... and ALL the other great posts here. We knew it was coming but it's still sad to see you stop. I loved this place. But why the site design overhaul? Tis rather drastic... :) Huge big letters, but it's not clear that they represent Music From The Third Floor, imho. Are you planning to do something else with "the brand" in the future? No immediate plans, no. I'm not even sure if 'Music From The Third Floor' was a very strong brand in the first place; most of the places that link to here refer to it as 'Third Floor Music', from the url. Essentially though, I was just tired of the old design, and knowing the blog was about to end, I wanted to leave it looking new and fresh. And I happen to like big bold typefaces at the moment. Well, I'd say I'll miss you PC but we'll keep in touch :) Thank you from the bottom of my heart for sharing so much great music over the years, as well as your knowledge and your humour! I like the new look :) Have been thinking of doing a major overhaul over at my place too. Cheers! Cheers Reza, you too. And Memsaab, of course we'll stay in touch! Thank you, thank you, thank you for all you have shared over these years. And congratulations on curating such a rich collection of music with such panache. Once again the same thing happening....All good things come to an end....eventuaaly...! Thank you for some amazing music! Sad to see it finally end, but happy to see you finish your journey. And the best for last! Unlike some hyped records, "Soul of Bobby" deserves its rep and perfectly caps your project. That box of records couldn't have fallen into better hands. Thanks for all the time and effort and awesome sounds. I cant believe it that the show has ended... will miss it like hell.. but have to thank u from the bottom of my heart for all the effort.. u really like rock PC.. hope u r back asap! Till then take care and Merry Christmas! Not sure I've ever commented here before, but I extend a hearty thanks for adding so much to my musical life over these last 4 (!) years. Thanks alot for sharing all this fantastic music! MFTTF is far and away my favorite blog on the innernets. As a fellow Bollywood head I was very pleased to see so many of my faves get the loving attention they so richly deserve - a good 90% of my treasure is cassettes, so it's nice to hear some sweet vinyl rips. thanks so much for this blog. I'm a late follower and totally bummed that this may be the end. You've brought lots of pleasure to all of us 'chelas'! I'm a recent chela. Thanks so much. It has been one of the best blogs in the sphere. All the best in the New Year. Great effort. Thanks a ton. Thank You for a great blog and some great music! and is not your culture. One thing you failed to mention is what kind of sampling did you do. I guess this kind of music no longer inspires you. I am sure you didn't spend $3000 for nothing. Thanks a lot PC for all these wonderful shares. I have a couple of times before posted my thoughts here. It is sad to see you take a temporary break but i sincerely hope to see you back. The rips that you have come up with are of superb quality and not to mention the crystal clear scans of the vinyls which are almost impossible to get anywhere at all, all over the internet.. Anonymous, I think maybe you've misunderstood, or taken that point way too literally. I simply meant that, after evaluating and posting some 200 Bollywood soundracks, I could do with a break and listen to something completely different for a while. It not being my culture and not understanding the lyrics doesn't play into it; western pop and rock is, and I once went off that for half a decade. I have nothing but good things to say about Geeta Dutt and this music that I've been blogging about for the past 4 years. I'd hardly have bothered if that wasn't the case. Good, exciting music, whatever the genre, wherever it originates from, will always inspire me. Well. Thanks PC for all the efforts u made to create this beautiful blog. It was a real treat. somehow, the blog has become a part of my internet surfing. In every day or two, i sneak into the place for whatever new updates are. I just loved the your rips. I will certainly miss this place & surely will not delete it from my bookmark, hoping to see you back again ...Have a great time...GOD BLESS. Enjoy your new-found freedom. You've earned it. Wow - what a way to finish. Really appreciate your massive effort on this blog - really made a lot of people happy. Long time since I commented now =P I used to be the first one most of the time. Thanks for sharing all the music PC, I will continue sending u stuff over Facebook etc. Meanwhile, you know whom to hit up if you find another pot of Gold ;-) (I remember your generous "Pantera" offer) That came like a cute surprise. Take care, Merry Christmas and Happy New Year Mr. Funk Soul'd Brother. Noooo...my brother in arms, my muse....mat jao!!! The standard of Hindi vinyl rips died the day PC hung his hat. And that is the truth. Regardless, I hope you do keep in touch. A NICE RARE ALBUM THANKS FOR SHARING. I'll echo the sentiments of Tom above, this is/was my favorite blog, and I really enjoyed your rips, covers, reviews, and comments from other loyal followers. Can't believe it's been almost four years. I guess I'll still end up checking in every once in a while hoping for a new post or upload, force of habit I suppose. Anyway thanks for sharing your collection, you did a great job... and have a Merry Christmas and Happy New Year, PC. Thank you PC for all these lovely rips. Please dont say you wont be back cause i am sure you will. I've really appreciated the time and effort that has gone into this blog and the wonderful music you've posted. On the strength of only hearing a few things, I'd become interested in Bollywood music, but it wasn't until I found your blog several years ago I was able to really dig in. You've been an excellent guide into a fascinating music, and your contributions will be missed. Man I am soooooooo late to this party.... I should just go and drown myself in a spoonful of water... (an old Hindi expression) Aaaargh!! Oh those film names... They all bring tears of joy to my eyes when I read them... Of all the memories, the childhood ones are so comforting... How true, I realised! Can you please reconsider and re-post some old tracks once in a while... specially those only rapidshare links of yore? I know RS is a business and has to support themselves, but their policies for freeloaders is nothing short of discriminatory (even zShare, badongo, easy-share to some extent)... Depositfiles, Mega, filefactory and mediafire.... (Oh I lovvve Mediafire, freeloaders can download multiple files) seem to be more freloader friendly.... **Ahem.. cough cough** hint for you in case you decide to re-up in future. I came here with only the vaguest interest in Bollywood film music, and thanks to your always enlightening and lively commentary I leave two years later as a lover of the form with favourite films, artists, eras, and genres. Many thanks from a pupil for these teachings! It was too intimidating and unknown a world for me to begin exploring it alone. I know from experience that writing about the things you love can impair your ability to simply enjoy them. Now that you will no longer be listening to the music with a critical ear, I hope you quickly rediscover the innocent joy of just listening. May the beat go on! Thankyou PC! Awesome blog, may it live long and prosper in internet land. Thankyou for all your hard work and dedication to sharing such great (and wonderfully strange at times) music. Look forward to your occasional revisits. Thankyou again! Although I'm sure you're heartily sick of Bollywood at the moment I'm sure you won't be able to stay away from it forever - it's like an addiction!! Thanks very much for all the lovely music. Enjoy your break, you deserve it! Thanks so very much for all the great music PC, and for being an inspiration (along with Memsaab) to start my own blog. 'Music From The Third Floor' nights will continue at my house for the foreseeable future. Hey how about one post a month?!! We need third floor back!!! I don't have anything left to post I'm afraid. don't worry there is always more in bollywood & indian music !!! Best wishes from Berlin, Germany! Hopefully you remember me. This is Zer0_II from the Digital Meltd0wn Music Blogroll. I have been updating all of the blogs I had tagged as being "on hiatus," and removing those which had been on hiatus longer than six months, unless I could get in contact with them and they notified me that they intended to update their blog in the future. I already noticed your comment above, so I'm not going to remove your blog from the list. I would like for you to contact me. There is something that I would discuss with you in a more private setting. If you could, please shoot me an e-mail to shockw4ve_x at hotmail. I look foward to hearing back from you. Take care. Thanks for not removing me. In fact, there should be a new post or two within the next couple fo weeks. Its 4 years of hard work and posts for a lifetime collection of music. Hats off to you PC. Thank you for every single bit that you have ripped ans saved and uploaded for us. I appreciate your work. wanted to say thanks again for your posts. we are playing these tracks tonight on our radio show NPR 102.7 KRNN, sundays 9-11pm Juneau, Alaska. we began posting our episodes at www.alaskanscorcher.com so tonights show will be up tomorrow. Fantastic! Listening to the podcast as I type. Thanks for sharing these, it's a fantastic blog. I found your site while looking for rips of some of my Bollywood lps and have of course ended up with a whole load of new wants. Thank goodness they're not as expensive as a few years ago!